This October is poised to be the worst month in history for Fixed Income Arbitrage managers, while the Managed Futures sector posts its best return of the year. The Fixed Income Arbitrage sector suffered significant losses to finish down an estimated 18% for the month. Prior to October, the worst month on record* for the Fixed Income Arbitrage sector occurred in October of 1998, when funds posted a negative 6.96% return. Many Fixed Income Arbitrage managers are still holding inventory in mortgage-backed securities and corporate bonds, which has materially impaired their ability to generate returns in this illiquid market environment. Conversely, the Managed Futures sector capitalized on short equity, short commodities and long US dollar positions to generate its best monthly return this year and positioning it as one of the two positive performing sectors in October. 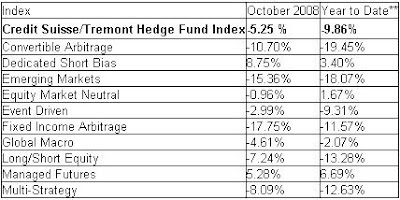 Early estimates indicate that the Credit Suisse/Tremont Hedge Fund Index was down approximately 5% in October, as extreme market volatility and extraordinary government intervention created a difficult trading environment. Estimates are based on 61% of assets reporting; final October performance will be reported November17th on Bloomberg and online at www.hedgeindex.com.